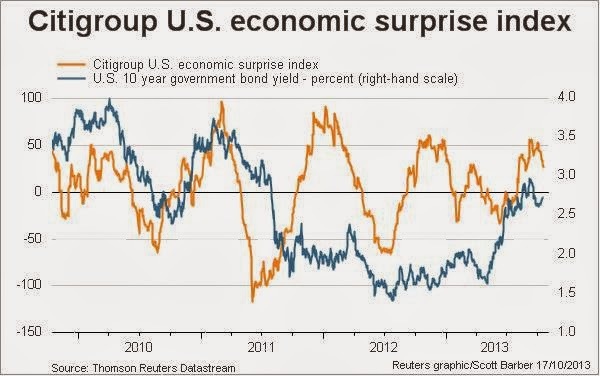 What a non-surprise from the Fed! As I awaited the FOMC announcement, I thought that the markets were expecting a highly dovish message that any hint of a balanced statement would cause the markets to sell off. Indeed, stock prices duly tanked as the FOMC statement appeared to have "disappointed" the market with a statement that was not even more dovish. In the Treasury market the risk is in the belly of the curve as traders and investors have plowed back into that sector and have reloaded the carry trade which fears of taper had led them to regurgitate in the May/July period. So if there is even a hint that that Fed might taper in 2013 that sector and associated spread product is at great risk. As an example of the extent of the recovery in the belly you can observe that the 2 year/5 year spread traded as wide as 134 basis points in early September when the market was at its worst levels (10s traded 3 percent then). That spread is now bank to 97 basis points as fear of tapering has receded rapidly. 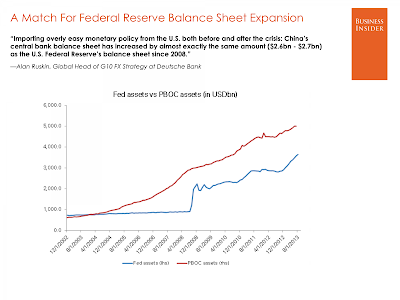 What's more, Jon ("Fedwire") Hilsenrath wrote today that Fed researchers believed that the Fed balance sheet would not return to normal until 2019 at the earliest. How much more or a bond bullish environment do you want? From a technical viewpoint, the 10-year yield has been rolling over, but it nearing a key level of technical support from both a chart support viewpoint but also a 38% Fibonacci retracement level. Should yields breach the key 2.43-2.50 level, there could be further downside to yields. The area of greater opportunity could come from the long bond. This chart of the 30-year yield shows that a similar topping pattern, but it has not reached the 38% Fibonacci support level yet, indicating further near-term downside. In conclusion, recent economic releases are weak and supportive of lower bond yields and higher bond prices. From a technical perspective, there is a better upside opportunity in the long Treasury in this trade. Further to my last post (see Watching for China-related volatility in November), a number of articles have indicated how the stakes are rising for China in the Third Plenary which is to be held November 9-12. A sensitivity analysis for three Asian upper-middle-income countries(China, Malaysia and Thailand) also shows that the situation related to a middle-income trap is worse than average in China and Malaysia. 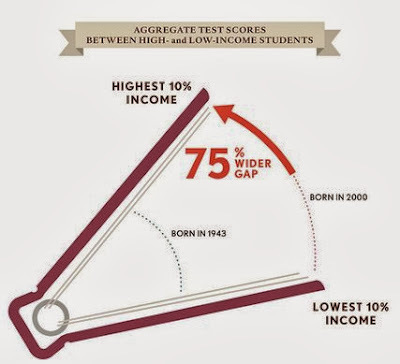 These two countries, according to the result of the sensitivity analysis, should urgently improve access to secondary education and should implement income redistribution measures to develop high-tech industries, before their demographic dividends expire. Income redistribution includes the narrowing of rural urban income disparities, benefits to low-income individuals, direct income transfers, vouchers or free provision of education and health-care, and so on, but none of these are simple to implement. GDP targeting no longer serves a good purpose. It sends a dangerous signal for resisting economic restructuring and sustaining speculation. Continuation of GDP targeting would lead to an economic hard landing and massive non-performing loans. 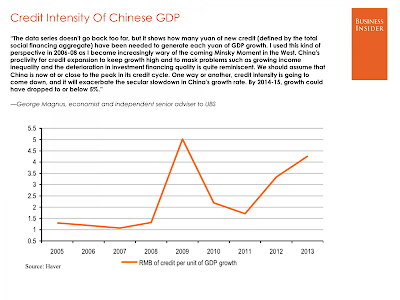 The recent upturn in GDP growth is not good news for China. It has occurred by further increasing the economic imbalance and prolonging speculation. It merely delays the inevitable economic restructuring and increases its final cost. The bursting of the property bubble is a necessary step in China's economic restructuring. It decreases funding for investment and increases it for consumption. Prolonging the property bubble is equivalent to resisting economic restructuring. 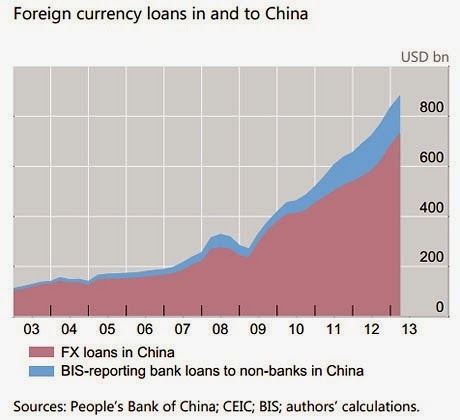 Market forces are likely to trigger China's bubble to deflate again, following the 2012 downturn, within six months. Liquidity will be squeezed between demand from growing fixed-asset investment and downward pressure due to the Fed tapering. The available liquidity for the property bubble will decrease as a consequence. 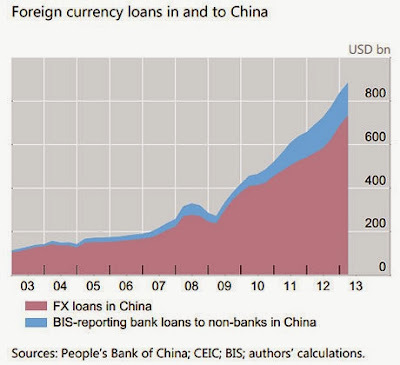 Further, China's credit creation increasingly depends on the shadow banking system. The higher interest rate in its credit creation makes the property bubble unstable. 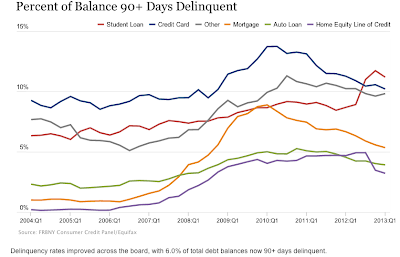 Even if the liquidity squeeze does not pop the bubble, the breakdown in credit circulation, due to fears of underlying asset quality, may do the bubble in anyway, just like in the United States in 2008. As an aside, see this WSJ article about a how a prospectus frankly discusses how Chinese banks make money from the shadow banking system without utilizing their capital. The will to end the bubble seems absent. Only market forces will bring it to the end. Dark clouds are emerging on both the liquidity and credit creation fronts. It appears that China's property bubble is likely to sink big in 2014. While a number of analysts have some general idea of what gets announced at the Third Plenary, I have no idea of how the market will interpret the announcements. Get ready for greater macro volatility in a few weeks. In October, we have seen considerable volatility over US government shutdown and debt ceiling concerns. 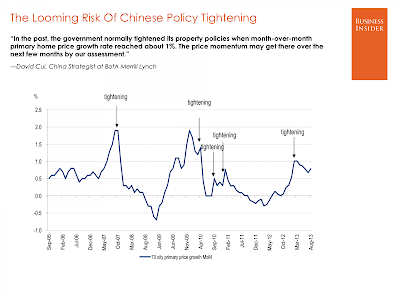 As October draws to a close, I am looking ahead to November and watching developments in China as a source of volatility. No point in getting too excited about China’s big policy bash — November’s third plenary session of the 18th Party Congress — just yet. It may be a once-in-a-10 year event but it’s probably going to be rather coy on detail. The entire post is useful reading inasmuch as it discusses what can be expected out of the meeting. Regardless, the Party goes to plenary as China faces a number of important challenges. The pattern is unmistakable. While early industrializers managed to place 30 percent or more of their workforce in manufacturing, latecomers have rarely managed that feat. 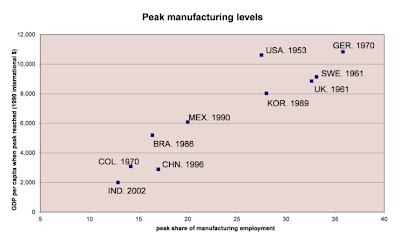 Brazil's manufacturing employment peaked at 16 percent and Mexico's at 20 percent. 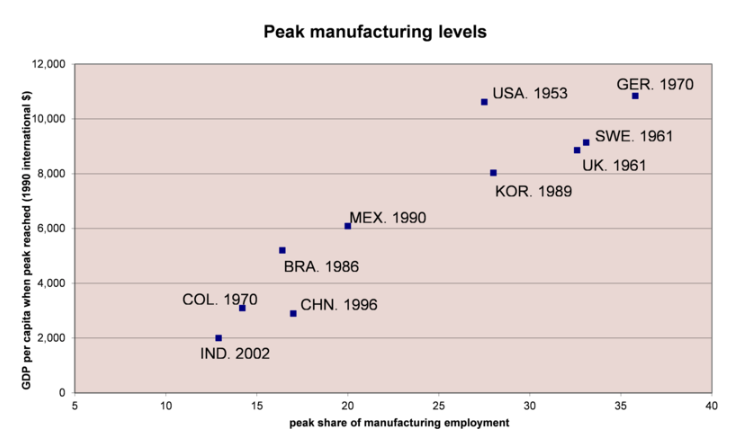 In India, manufacturing employment began to lose ground (in relative terms) after it reached 13 percent. This may come as a surprise, but even China employs few workers in manufacturing, relative to its huge labor force. Moreover, the manufacturing share of employment in China seems to be coming down (caveat: Chinese data on manufacturing employment are problematic). As I explain in a new Project Syndicate column, the early onset of deindustrialization has a number of implications. On the economic front, it slows down growth and delays economic convergence. Politically, it forecloses the typical path to democracy -- through the development of a labor movement, disciplined political parties, and habits of compromise and moderation arising out of industrial struggles over pay and working conditions. In other words, China may have reached its Lewis turning point and export led growth is set to slow. Such a slowdown can create political problems. The following graph from the ANZ Banking Group shows that – as opposed to the period until 2008 – net exports do not add to GDP growth. This means that global imbalances caused by China are not increasing. 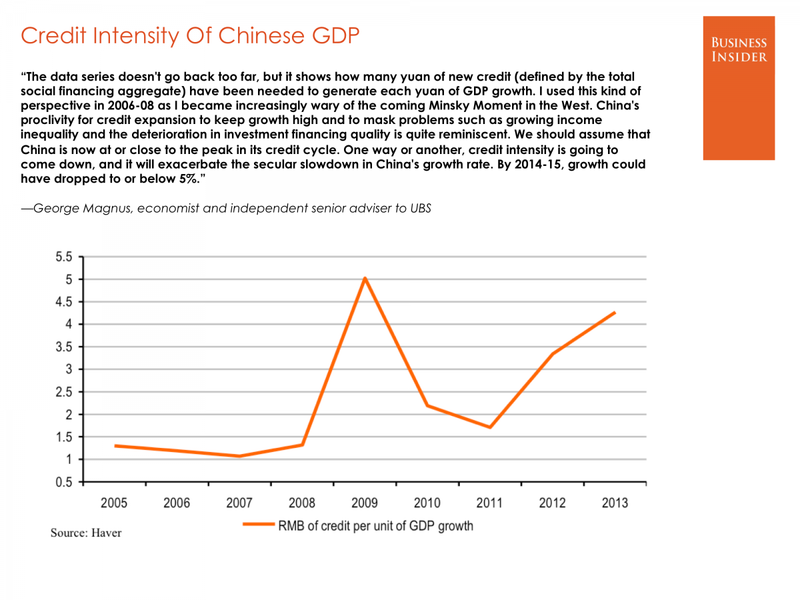 On the other side, Chinese growth is still driven by investments. 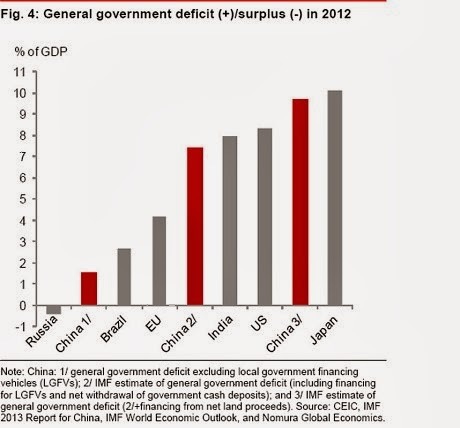 Data from the International Monetary Fund shows that China’s budget deficit reached 9.7pc of GDP last year if regional spending is included and one-off land sales are stripped out. This is higher than previously thought and above levels in the US, India, or Southern Europe’s debt-stricken crisis states. 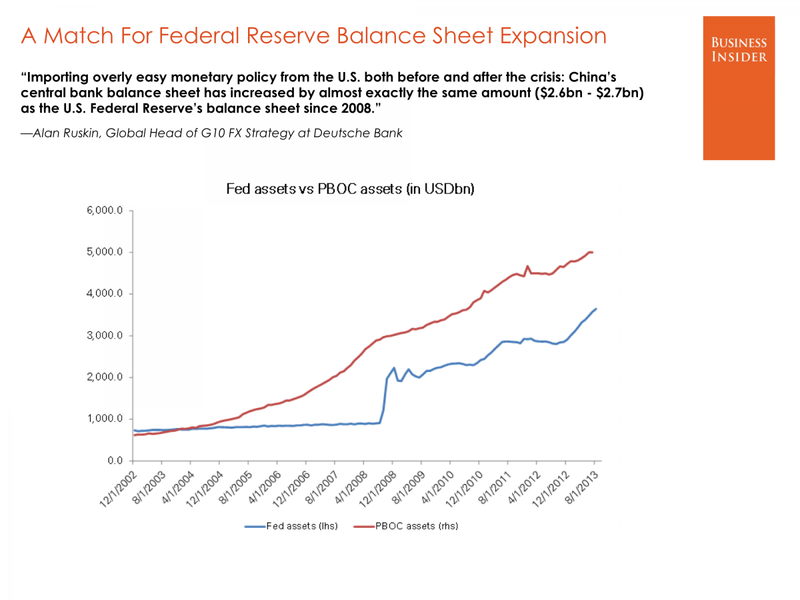 Pettis believes that China will not see a Lehman-style crash because the banks are perceived to be all government guaranteed, but the costs will be repaid in the form of Japanese Lost Decade(s) like slow growth. I would, however, add one caveat to Pettis' analysis - we have no way of forecasting the contagion effects of a Chinese bad debt crisis. While the Chinese banks may be supported by the Chinese government, no one knows if any western large financial institutions are overly exposed to China's loan markets. Let's suppose that a large global bank like HSBC (it's only an example, I know nothing about HSBC's exposure to China) were to get severely impaired over a Chinese shadow banking system/subprime-style crisis (see my previous post The canaries in the Chinese coalmine for a discussion of the shadow banking system and wealth management products), could such an event create havoc in the global financial system? What if a Chinese banking crisis were to arise and global risk premiums on emerging market debt were to skyrocket, you can't tell me that these large global banks aren't exposed to emerging market debt in places like Brazil, India and Turkey. 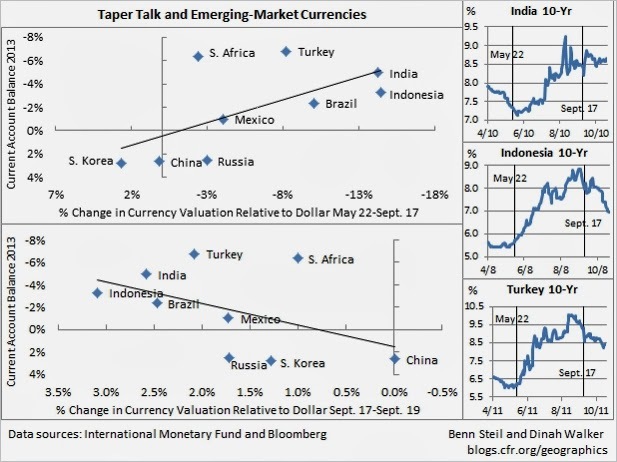 We saw a preview of what happened when the markets got just the whiff of Fed tapering - risk premiums on emerging market debt shot up and the risk of emerging market currency crises rose accordingly. Shifting to a sustainable growth path––one that uses resources more efficiently, is more inclusive, and more consumer-based––requires actions on several fronts: financial sector and fiscal reforms, as well as structural measures. Further financial reforms are essential to contain the buildup of risks, enhance the efficiency of investment, and boost household capital income. The main dimensions of reform are deposit rate liberalization; the elimination of perceived widespread implicit guarantees on financial products and intermediaries through the introduction of deposit insurance, and a formal resolution framework for failing institutions; and gradually moving away from administrative guidance on credit allocation to adopting a policy rate as the main operating target for monetary policy. Fiscal reforms, including giving local governments authority over their own revenue sources more in line with their expenditure mandates; shifting the tax burden toward progressive and efficient forms of taxation; and channeling dividend payments from state-owned enterprises to the budget; all these measures will complement financial sector reforms in addressing the vulnerabilities in local government finances, reducing excess investment, and boosting household consumption. The third broad area––structural measures––will reinforce the impact of financial and fiscal reforms and enable a shift toward a growth model less reliant on capital accumulation and more dependent on the efficient use of resources (‘total factor productivity’ growth). The measures include leveling the playing field within and across sectors through deregulation and easing barriers to entry (particularly in services); raising resource prices to rationalize investment and protect the environment; and reforming the hukou (household registration) system to improve labor market mobility and achieve a more efficient matching of workers to vacancies. Implementing these significant measures is a tall order and involves tough choices, including possibly accepting slower growth as the economy adjusts to the new path. But starting now will allow China to sustain its convergence to the level of higher income economies and deliver the benefits of growth to an ever-wider cross section of its population in a way that’s environmentally sustainable and sound. But delay reforms and the challenges grow larger, raising the probability of stalled convergence. China’s leadership recognizes the challenges and has already indicated their reform objectives. The priority now is to lay out and then, critically, implement concrete reform plans to manage the transition to a new growth path. The stakes are high, especially when 124 countries count China as their biggest trading partner – compared to 76 for the United States. A hiccup, or even any shifts, in the Chinese economy will have global implications. We will all be watching the Third Plenary for signs of direction from the Party. Remember, the plenum is a Party confab, not the government. The best analogy I can give is what happens under a British parliamentary system. The party in power can hold a meeting (a plenum) to discuss the way they want to move forward. Such pronouncements do not necessarily equal immediate government policy, even though the party holds a parliamentary majority. China's biggest bank tripled its loan loss provisions: Is that bullish because it's finally facing reality and cleaning up its books, or bearish because it's a sign of weakness in the financial system? China's interbank market rates are rising, suggesting a repeat of liquidity worries. Isn't financial liberalization the way forward? 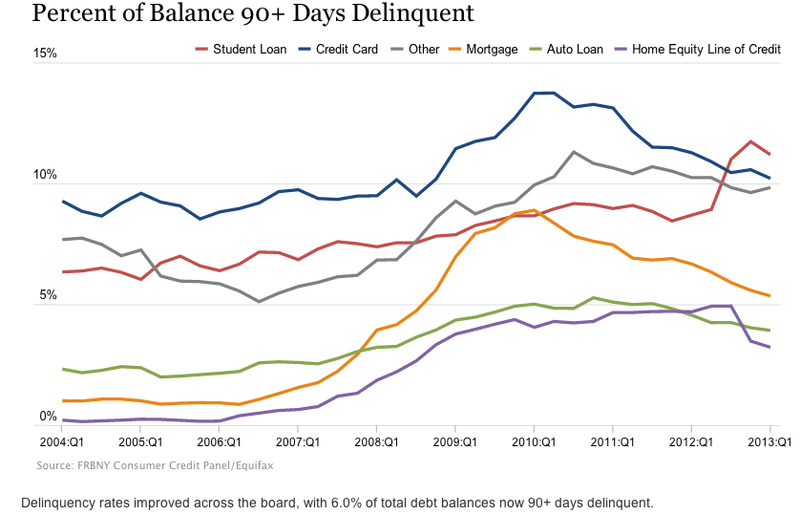 Or did you want more of the unbalanced credit and infrastructure driven growth? No doubt we will see more announcements out of Beijing. Don't expect them to have too much specifics, as they are more meant to set direction. 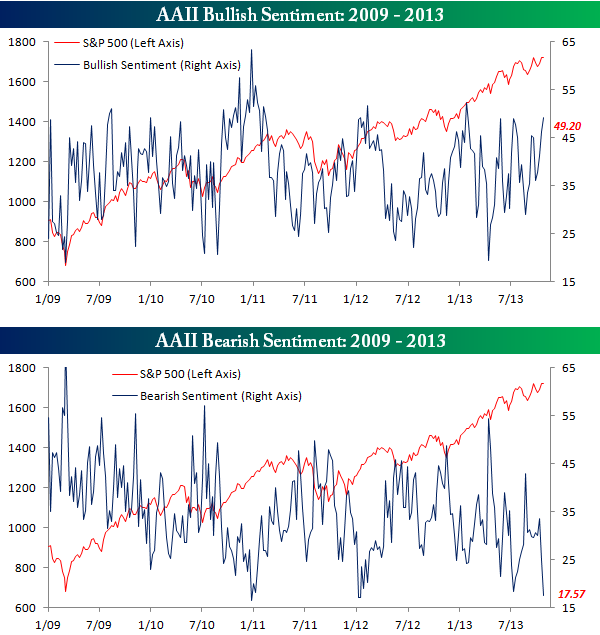 Will the market interpret the announcements bullishly or bearishly? I don't know, but as the chart of the Shanghai Composite shows, the index has already violated a technical uptrend and an important support zone, which indicates market nervousness. 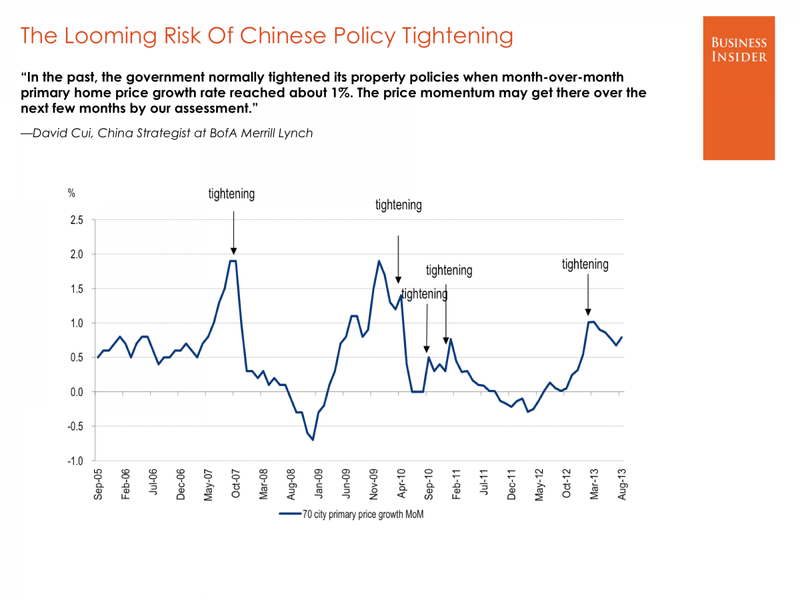 Be prepared for greater China-related market volatility in the weeks ahead. I wrote that my inner trader was turning more cautious after getting long to await the post-government shutdown/debt ceiling relief rally (see Time for a market pause?) and my tactical position remains unchanged. Look around today's markets and you'll see a surfeit of senseless investment opportunities wearing the cloak of legitimacy. You'll see, on page one of the New York Times, a start-up called Fantex touting a new investment vehicle that allows fans of NFL running back Arian Foster to support his career by purchasing stock that gives them a share of his future earnings. (What didn't make page one: Foster's career-worst game the very next Sunday.) This investment opportunity, which will appeal mainly to those too young to remember Bowie Bonds, is a terrible idea on multiple fronts: It bases returns on the unpredictable performance of professional athletes, it gives stock that can only be traded on a private, relatively illiquid exchange, and its single-athlete stock can be converted into common Fantex stock whenever the company feels like it. You'll see Bitcoins, the everlasting fascination of Silicon Valley crypto-geeks, being not only spoken about as an investment-grade commodity despite having higher volatility than your average Baldwin brother, but inspiring entire investment vehicles (one of which is structured by celebrity twins) that give ordinary investors as well as the tech-savvy crowd the chance to lose money when the fad runs its course. You'll also see art dealers trying to convince you that betting on the paintings of unknown artists is a sound portfolio move. I could go on, but you get the idea. The dumb money is now chasing the risk trade. These conditions suggest that markets are vulnerable to a pullback, but without a bearish catalyst, markets can continue to grind higher. Like an elephant getting in or out of a bathtub, their buying and selling is there for all to see. Despite prices holding up near their highs in many cases, there is net selling taking place in the liquid glamours, as well as in some of the tertiary leaders. While this began a few weeks ago in some cases, Tuesday it was seen in a number of stocks, including Priceline.com , Facebook and LinkedIn, name just a few. Notably, this selling occurred on a day in which the Nasdaq Composite was up. Others not listed above were distributed on Monday or Wednesday. Perhaps the truest sign of institutional sentiment are the liquid glamours, those titles that are gifted with rapid earnings growth and also deep liquidity. Institutions can never own enough of these simply because liquid glamours do not grow on trees. Large investors, such as mutual funds and pension funds, often overweight these names in their portfolios as a means of differentiating their performance from those of their peers and their benchmark, e.g. 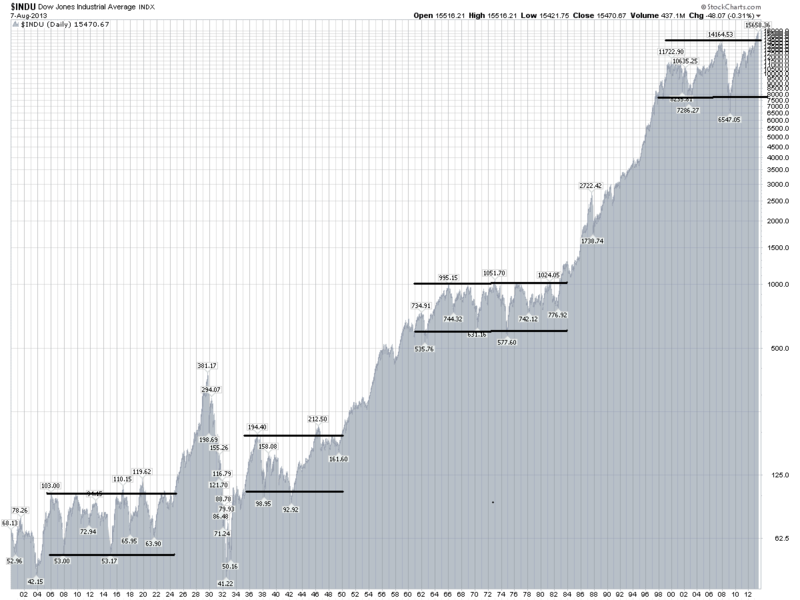 the SP 500. Asset allocators have scaled back their equity holdings. 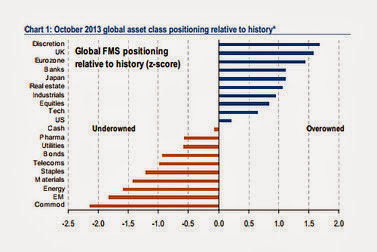 A net 49 percent of global asset allocators are overweight equities, down from a net 60 percent in September. Over the past month, investors have reduced their positions in eight out of the 11 sectors monitored by the survey. Last month, a net 9 percent of the panel remained overweight U.S. equities, and this month, that measure has dropped to zero percent. At the same time, investors have shifted back towards fixed income, scaling back their underweight positions in bonds and portfolio cash levels rose. What more do you need to know? This is a time for caution. Don't try to be a hero. In other words, trying to call the stock market in the short term is very hard work, but calling it long term is relatively easy. 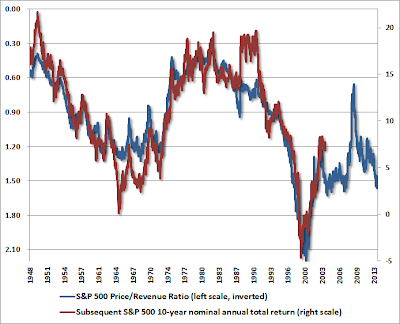 However, there is a right way and a wrong way to forecast long run equity market returns. Robert Shiller is well-known for his analysis showing that long-term stock real returns, i.e. after inflation, to be 7%. With CPI at 1.5%, the long term stock returns should be 8.5%, right? There are a number of problems with that approach. 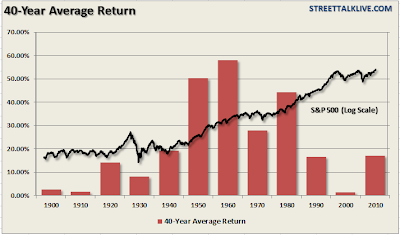 First of all, will you live long enough or be patient enough to see those kinds of returns? The long-term chart below shows periods when the stock market has been in multi-decade range-bound episodes. If you are in one of those periods, your returns may be subpar for a very long, long time. Can you be that patient? Lancer Roberts, writing at Pragmatic Capitalism, made the same point. Stock returns depend on when you start. As the chart below shows, there are wild variations in equity price returns, though an upward long term trend is discernible. 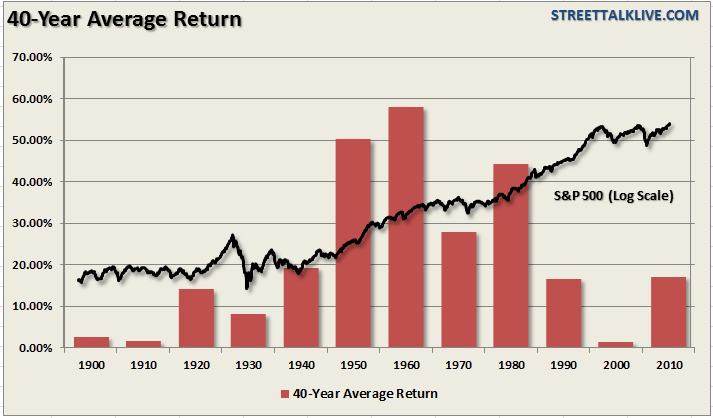 Here is Roberts' analysis of 40-year stock returns by starting decade. Do you want to roll the dice on what you get? Most analysis of stock returns have focused on US equities - which suffers from a survivorship bias because the US market is not the only market in the world. Imagine that you wanted to invest in the capital markets in the year 1900. The stock market was nascent and undeveloped, the major markets where most of the the global capital was invested was the bond market. Consider what the developed and emerging markets were in 1900. The bluest of the blue chips was the British bond market. Other developed markets included France and Germany. Oh, yeah, don't forget the Austro-Hungarian Empire. 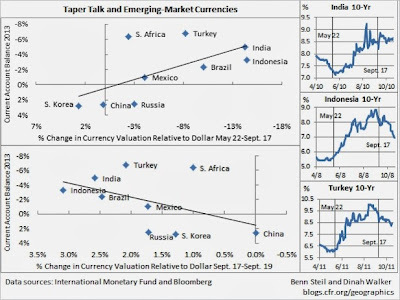 If you wanted to take more risk, you could have looked at emerging markets such as Russia, the US, Canada, Argentina and Japan. The point I am trying to make here is we have no idea who the winners and losers will be in the future, so if you step back in time and only considered the returns of the winner (US equities) in your study, you will have overstated returns by a huge margin. How much would Dracula be worth? Think about it this way, let's take Robert Shiller's assertion that equity real returns of 7% to be correct. Supposing that a hypothetical immortal like Count Dracula (hey, vampires are rich - they have castles and other stuff, right?) invested $10,000 into the stock market 500 years ago. Assuming 3% inflation over the 500 years, Dracula's wealth he would have today would have 24 zeros after it. Is that plausible? Destruction: The reason why Dracula might not be a super-tycoon is that in the last 500 years, a lot of empires went down and a lot of people got killed in some very nasty ways. Wealth was destroyed during those episodes. Volatility: This is the "conventional" risk that most academics focus on, but it's not the only source of risk. Uncertainty:: Uncertainty can be best described as the risk of fraud or poor governance. Morningstar described it as: "The simplest species of uncertainty is not knowing when writing a check whether the other party is a crook." In summary, using these very long term estimates of equity returns are problematical at many levels. Even if we were to assume away the risks of destruction and uncertainty, there are huge variations in stock returns and you may not live long enough to see the 7% real return postulated by Shiller. I prefer a more realistic approach. Instead of using multi-decade long time horizons, a more realistic forecast horizon is 3-7 years. As the Royal Swedish Academy of Sciences noted, "It is quite possible to foresee the broad course of [stock] prices over longer periods, such as the next three to five years." My principal approach to 3-7 year equity return forecast is based on two elements, valuation and demographics. In the short run, valuation doesn't matter much to the direction of stock prices. In the 3-7 year time frame, valuations matter a lot. 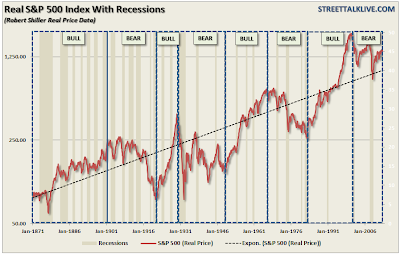 The simplest way to forecast prices is to watch stock market.valuation. The long-term chart of the Dow at the beginning of this post shows that the stock market has moved to new all-time highs, indicating that equities may have broken out of a range-bound period. 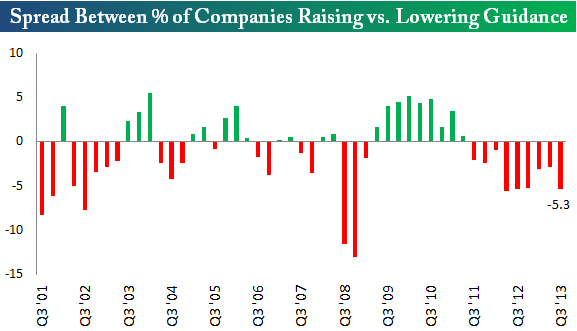 I am skeptical of that view because of valuations. 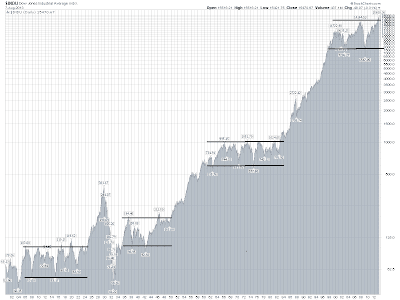 Consider this chart of market cap to GDP that goes back to 1927 as a proxy for price to sales for the US stock market. Does this look cheap to you? 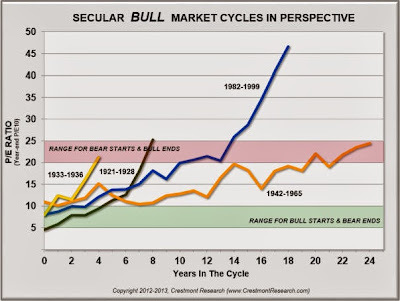 Past secular bulls have not begun with valuations at such elevated levels. What are smart investors doing? If you don't want to do the work to judge whether the stock market is over or undervalued based on P/E and other valuation measures, one simple way is to watch what smart investors are doing. 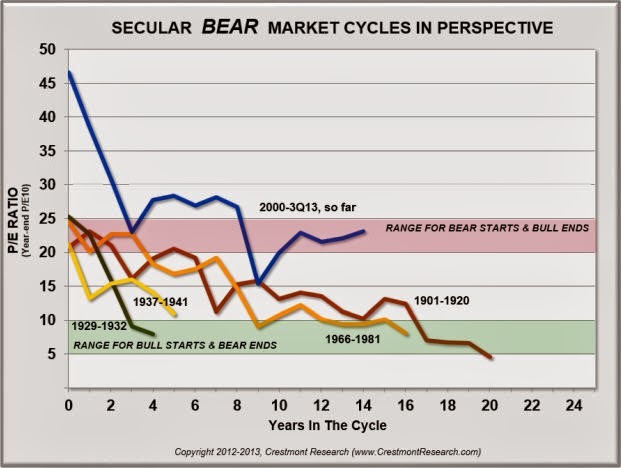 Here, the signals for long term returns are ominous. 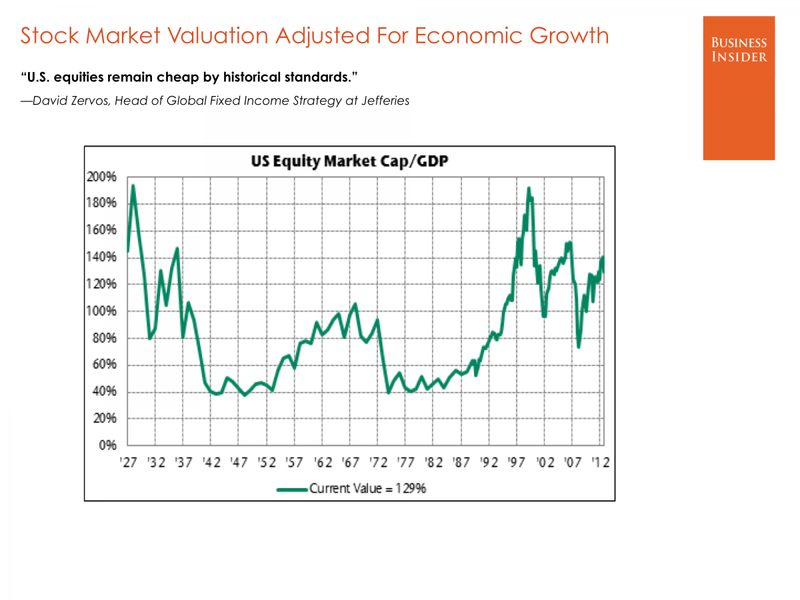 One common thread of these smart investors is that their belief that stock prices are fairly or over-valued, but there is no imminent risk that the market goes over a cliff. Another way of forecasting stock prices is to study the demographics of equity supply and demand. I have written about the demographics issue before (see Demographics and stock returns and A stock market bottom at the end of this decade). For stocks to go up, there has to be more buyers than sellers at a given price. The propensity of Baby Boomers, as they move into retirement, is to take money out of stocks. In order for equities to rise, those negative fund flows have to be met by the retirement savings of their children, the Echo Boomers. Two research groups looked into this topic (see papers here and here). Their conclusion - the inflection point at which the fund flows of Echo Boomers moving into stocks start to overwhelm the Baby Boomers taking money out is somewhere between 2017 and 2021. Given the large number of boomers knocking on the 70+ door, these findings should not be ignored. 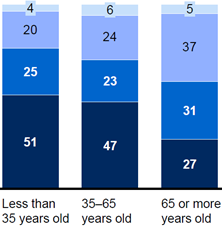 In another study from 2012, McKinsey Global Institute found that U.S. households reduce their exposure to equities in a meaningful way as they grow older, supporting Arnott’s and Chaves’ conclusion that large cohorts of 70+ year olds is bad news for equity returns (chart 3). We know that U.S. baby boomers own 60% of the nation’s wealth and account for 40% of its consumer spending, so their effect on the economy and financial markets shouldn’t come as a surprise. However, the comments from Buffett et al are also revealing. 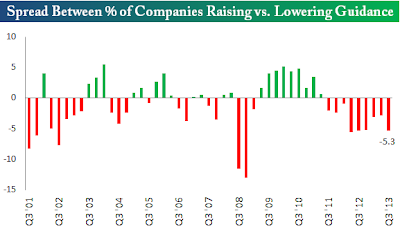 While equity valuations appear to be elevated, there is underlying momentum in Berkshire's businesses so there doesn't seem to be any imminent risk of a bear market. So should you be bullish or bearish? That depends on your time horizon. The best perspective is one chart produced by Steve Suttmeier of BoAML. The firm's official view is that the major stock averages have convincingly broken out to new highs and we are seeing the start of a new secular bull. 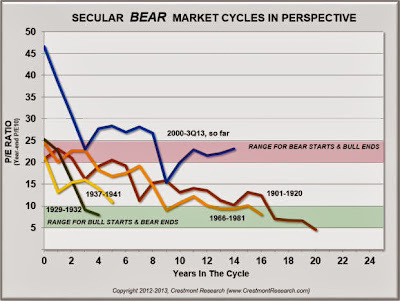 However, Suttmeier found parallels between the current range-bound market with the 1966-1982 period and did allow for a final bearish relapse before the market blasts off to new highs as they did in the mid-1980's. In the meantime, my inner trader is staying long this market and enjoying the ride. Time for a market pause? OK, the major US equity averages have staged upside breakouts to new all-time highs. What's more, US market strength has been confirmed by upside breakouts and uptrends in many other foreign market indices. 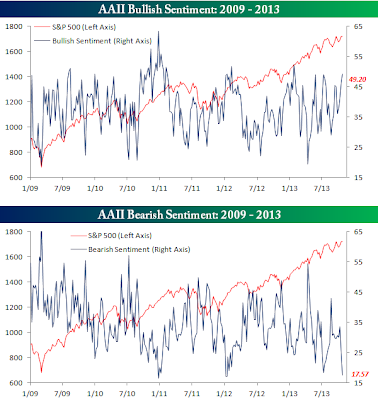 However, markets are overbought and short-term sentiment models are nearing crowded long readings (see AAII bull readings via Bepoke). This suggests that the stock market may be in for a consolidation or minor corrective period lasting about a week or so. Consider this chart of the SPX, which poked its head above the 2 standard deviation Bollinger Band last Thursday. Many other US indices, such as the NASDAQ Composite, Russell 2000, etc., also closed above their 2SD Bollinger Bands at the same time. Markets that close above their 2SD Bollinger Band levels generally don't stand there for long. I circled the last occasion when this happened, which was mid-September, and the market retreated back to bottom of the 2SD band. What happens when the SPX closes above its 2SD Bollinger Band? To answer that question, I went back to 2000 and found 68 occasions when we saw such a signal. I then calculated the median cumulative return 1-10 days after the first instance of the signal. The results are shown in the chart below. The red bars represent the median return after a close after the 2SD band and the blue bars are for all instances during the study period. As you can see, the market underperformed in these instances. Negative performance bottomed out, on average, seven days after the violation of the 2SD level - which was last Thursday. Note that the return for Monday, October 21st represents day 2 of the signal. In addition to the return metric, I also considered the batting average of this signal, as measured by the percentage of positive cumulative returns after the signal. 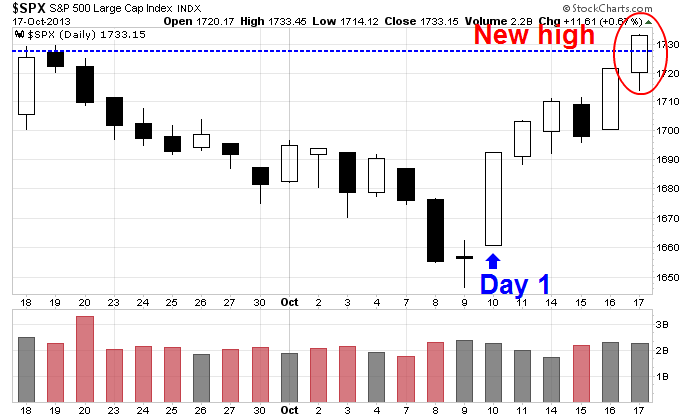 As the chart below shows, the SPX typically starts to weaken significantly on day 4 and bottoms on on day 7. Despite the looming US debt default on Wednesday, the high frequency data this week generally had a positive bounce. The long leading indicator of interest rates improved, and mortgage refinance applications had a slight rebound, although purchase applications and real estate loans remain negative. Money supply remains positive and seems to have stopped decelerating. Spreads between corporate bonds and treasuries also slightly improved this week. 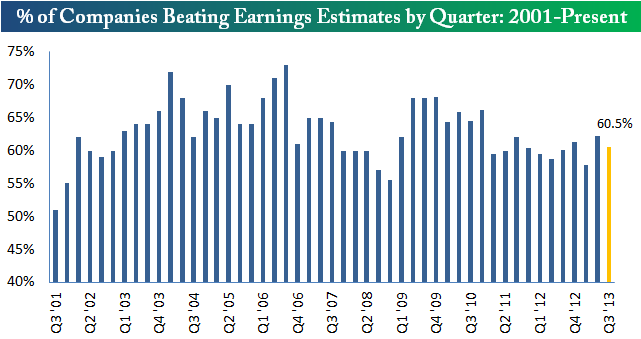 This is the second consecutive week that forward 12 month earnings have ticked down and the continuing downward revisions represent another headwind for market bulls. My inner trader is in the business of playing the odds. The odds suggest that we are due for a one-week pullback and consolidation of the gains that stocks saw last week. If history is to be our guide, then any correction is likely to be shallow. My initial SPX target is the 20 day moving average, which is about the 1700 level. If the correction were to get deeper, it would likely get halted at the bottom of the Bollinger Band, or the 1650-1660 level. Bottom line: Analysis of the intermediate term trend indicates that the bulls are in control of the tape, but the short-term technical picture suggests that markets look a bit extended and may be due for a brief pause or pullback. There is potential for lots of volatility in the week ahead. 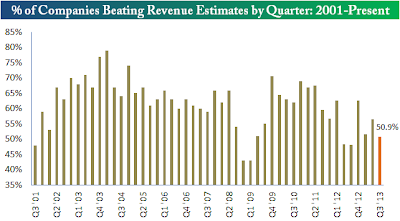 About 30% of SP500 components will be reporting earnings and there will be a couple of major market moving events. On Tuesday, the US releases the all-important employment report, which was delayed because of the government shutdown. On Wednesday, the ECB will be releasing the details of its Asset Quality Review of eurozone banks. It is not a stress test, but a review of eurozone bank assets, but the report has the potential to shake up markets. At the very least, traders may wish to step aside given the unpredictability of the cross-currents. Could inequality have caused the Washington standoff? There has been a lot of discussion on the blogosphere about growing inequality in the United States and its possible negative effects. See examples from FT Alphaville, the IMF paper on inequality and monetary policy, Josh Brown wondering if inequality is responsible for why the American economy can't recover and Washington's Blog,. One unintended consequence might have resulted in the recent Washington confrontation over the government shutdown and debt ceiling. This isn't some socialist rant, so stay with me on this. As Jeremiah Tattersall exasperatedly puts it, Yoho is living in an echo chamber with people just like him. That's what happens when you win a district drawn in such a way that you win 65% of the vote. "You answer to birthers. You answer to people who seriously believe you're like Martin Luther King Jr. and Rosa Parks and would be standing next to them," said Tattersall, a field staff of the North Central Florida Central Labor Council, a group that opposes Yoho and often demonstrates against him. "And you answer to people who don't believe the debt ceiling is a real thing." Tattersall is right. If you walk up to 20 people at random at various points in this district, there's a good chance that at least 15 will appreciate the fight in which Yoho is participating on their behalf in Washington. The economists' warnings, the temporary Wall Street freak outs — nothing has tempered their willingness to engage in this battle. 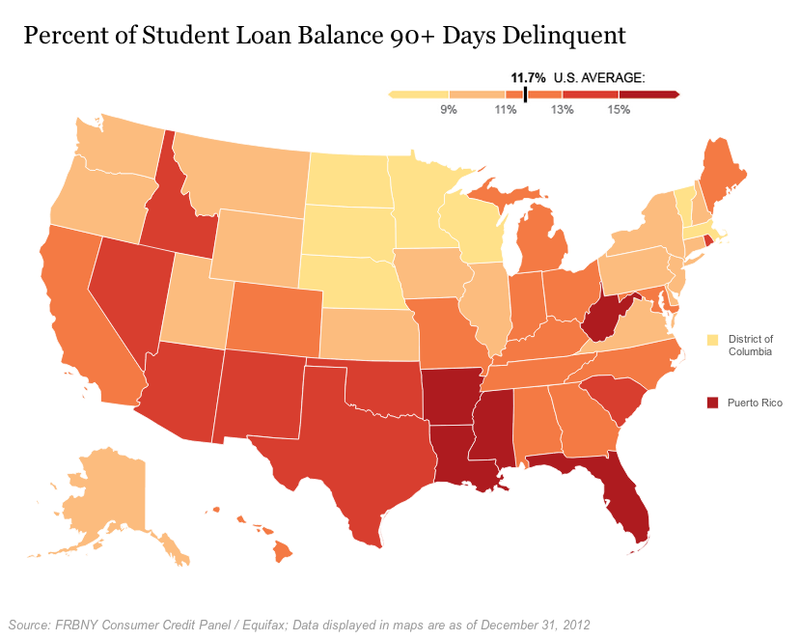 Why aren't you concerned about defaulting? "The people who are saying that are using scare tactics," said Todd Newtown, the clerk of the Circuit Court in Trenton. It's almost a unanimous consensus among economists. "Well, sure, the Ivy League liberals ..."
There are more than a few Republicans and conservatives who agree that breaching the debt ceiling and risking default would be dangerous, no? "I think they've bought into the scare tactics." Asked about what they would cut out of the federal budget, the Yoho constituents' consensus was foreign aid and arts funding. Such comments are typical of the sentiment that I have heard from Tea Party supporters. Notwithstanding the fact that the foreign aid budget is a drop in the bucket of the federal budget, much of what is termed "foreign aid" can be properly classified as part of the military budget for the United States. Wikipedia shows that in the 2011 US foreign aid budget was roughly $50 billion (out of a total of $3.5 trillion in spending). Most of the foreign aid budget went to the following five countries (in order of magnitude): Afghanistan, Israel, Iraq, Pakistan and Egypt, most of which is military aid for American weapon systems that benefit US manufacturers. As well, aid to most of those countries are for US national security purposes. For example, aid to Afghanistan, Iraq and Pakistan are in support of US military operations in the region and aid cutoff could severely hamper operations in that theatre. Similarly, arts funding represents roundoff error in the federal budget and their complete elimination does little to affect the level of the deficit. 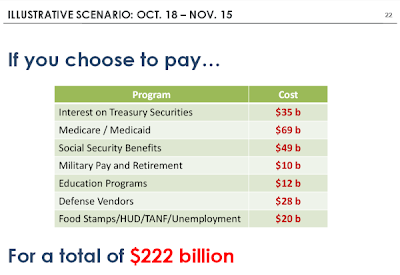 As well, one of the solutions to hitting the debt ceiling was the prioritization of payments. This way, it was thought, Tea Party supporters could achieve their ideological goal of smaller government. 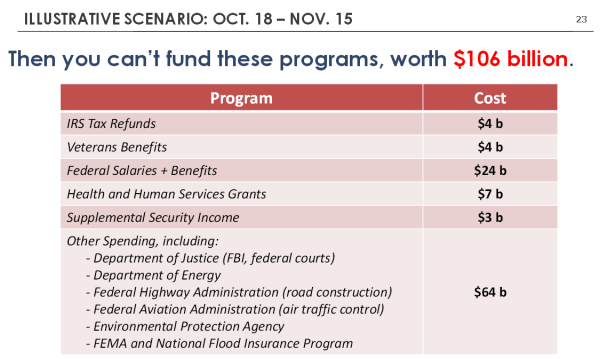 The Bipartisan Budget Policy Center recently laid out some sample choices on what was needed to close the budget gap in the case of payment prioritization. 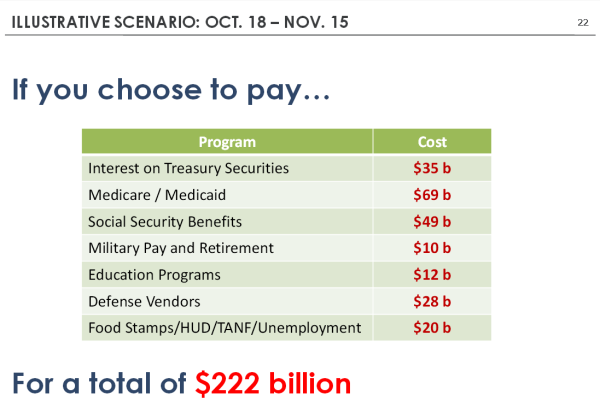 While the points raised in these slides are moot in light of the latest political developments, they nevertheless illustrates the difficult choices that need to be made. Have Tea Party supporters actually gone through the realities of the budget and done the math? Could math and financial literacy be the problem? Then it came to me, it's not that Tea Partiers are stupid, it's just the broad American population doesn't score well on math and financial literacy compared to other major industrialized countries, as per this USA Today report. (Here is a sample version of the test.) Maybe they are just not math and financially literate! The findings, out Tuesday from the U.S. Department of Education, could add new urgency to U.S. schools' efforts to help students compete globally. The new test was given to about 5,000 Americans between August 2011 and April 2012. The results show that the typical American's literacy score falls below the international average, with adults in 12 countries scoring higher and only five (Poland, Ireland, France, Spain and Italy) scoring lower. In math, 18 countries scored higher, with only two (Italy and Spain) scoring lower. In both cases, several countries' scores were statistically even with the USA. To bolster my point, a recent FINRA study found that way over-estimated their own financial knowledge but scored badly on the basics of finance. How could that be? The US higher education system remains the envy of the world. The United States gets the lion's share of Nobel Prizes and parents from all over the world strive to send their children to schools like Harvard and Stanford. The bifucation is becoming increasingly acute given the reality that not everyone can go to a top school like Princeton or Yale, where earnings prospects are considerably higher. In effect, the elitism that exists in the higher education system is creating inequality and a two-tiered economy (see my previous post Another American step to Argentina). A recent Hamilton Project study showed how income levels affect education. The education system is becoming Darwinian even for the very young. 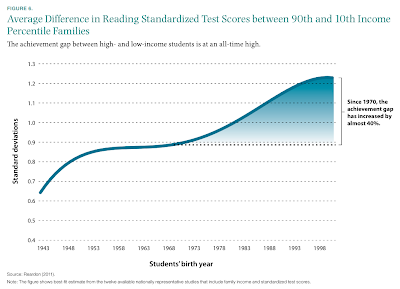 As the chart above from Strauss and the chart below shows, wealthier families can afford to invest more in their children and the results show it. High achievers get into the best schools. While the stated admission policy of a school like Harvard is "needs blind", most people don't get into Harvard without enrichment when they are young, which costs money. 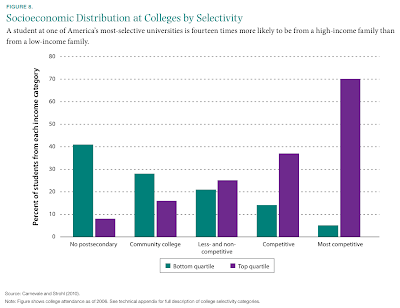 The chart below shows the level of college admission by income quintile (bottom = green, top = purple). It seems that one of the unintended side-effects of the growing inequality is the lack of financial and mathematical literacy. When combined with the Tea Party's populist anger of being isolated and left behind, it resulted in a misguided willingness to take the country over a financial cliff over the issue of the debt ceiling and possible default. It seems that we may have to put up with greater polarization and political volatility in the United States. It's no wonder that the US debt rating is getting increasing scrutiny from the rating agencies. Regular readers know that I have been bullish in the last couple of weeks in anticipation of a relief rally (see Get set for the relief rally and The sun will come out tomorrow). However, I have been less certain about the course of the market once the relief rally runs its course. For now, I am giving the bull case the benefit of the doubt, but a number of indicators are troubling me. Day 1 is the day of the rally off the bottom. In this case, that occurred on October 10. 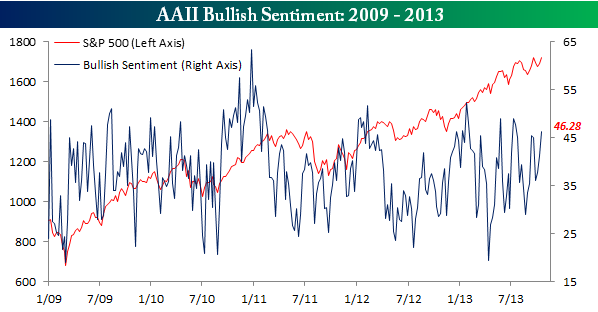 A "follow-through day" is a day when the market rises 1.5% or more on higher volume than the previous day. Follow-through days that occur after day 7 indicate weak rallies. O'Neil says that while follow-through days can give off false signals, no sustained rally has occurred without a follow-through day. Yesterday, which was Day 4, almost qualified, but no major average achieved a gain of more than 1.4%. It's not quite time to throw in the towel yet, but I would like to see signs of positive momentum in the stock market before Tuesday, which could be volatile because of the scheduled September jobs report. 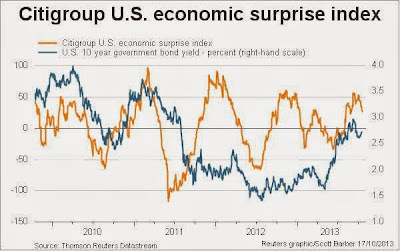 More troubling is the loss of momentum shown by the Citigroup US economic surprise index, which measures whether high-frequency economic releases are beating or missing expectations, is starting to keel over. While the level remains positive, indicating more beats than misses, the loss of momentum is a concern. 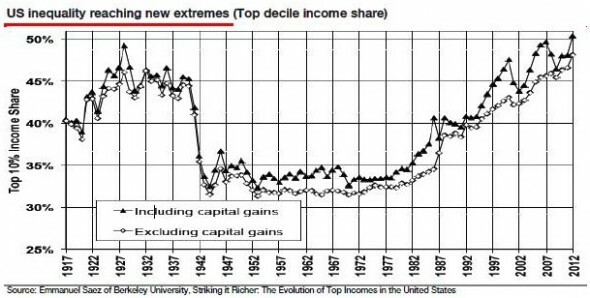 The strength of the American economy has been the consumer, but the economic recovery has been incredibly uneven as much of the gains have accrued to the top income earners. This effect can be seen in the relative performance of Tiffany (TIF) against Wal Mart (WMT). The chart below shows the TIF/WMT ratio (in black) and the SPX (in orange). 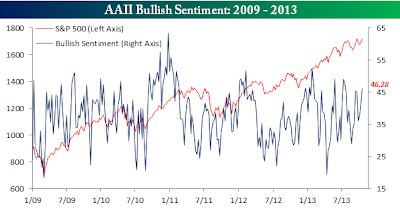 A rising ratio has been correlated with a rising stock market. The ratio recently saw a minor violation of its relative uptrend, but it could be a blip related to uncertainties over the government shutdown. 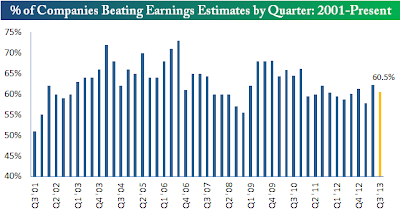 Earnings outlook: How is Earning Seasons progressing? Macro outlook: Any signs of a slowdown? 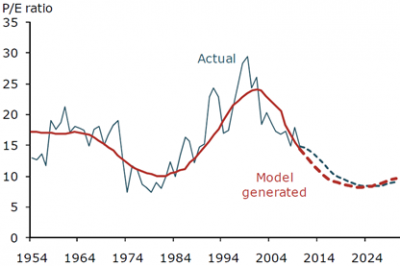 Monetary policy: How easy is the Fed? My most recent post address these topics (see The sun will come out tomorrow) ranked the earnings outlook as neutral, macro outlook as neutral and monetary policy as bullish. However, the latest data points are pushing the macro outlook negatively and my inner trader, while cautiously bullish, is getting increasingly nervous. How does the Washington impasse end? Ask Italy!